Below is a ritual of conjuration based on Johannes Trithemius’ “Art of Drawing Spirits into Crystals” and the “Clavicula Solomonis”, both available at the Esoteric Archives. I’ve modernized the language and format and style, but the ritual itself is simple: a series of prayers that consecrates the tools and area, a conjuration of the spirit into the area, a chat with the spirit, and then the leave to depart. It’s a simple ritual and can be adapted or abbreviated in many ways. Trithemius supposedly developed the ritual as an implementation of the guidelines and suggestions present in Cornelius Agrippa’s “Fourth Book of Occult Philosophy”. The following tools are required for the ritual. 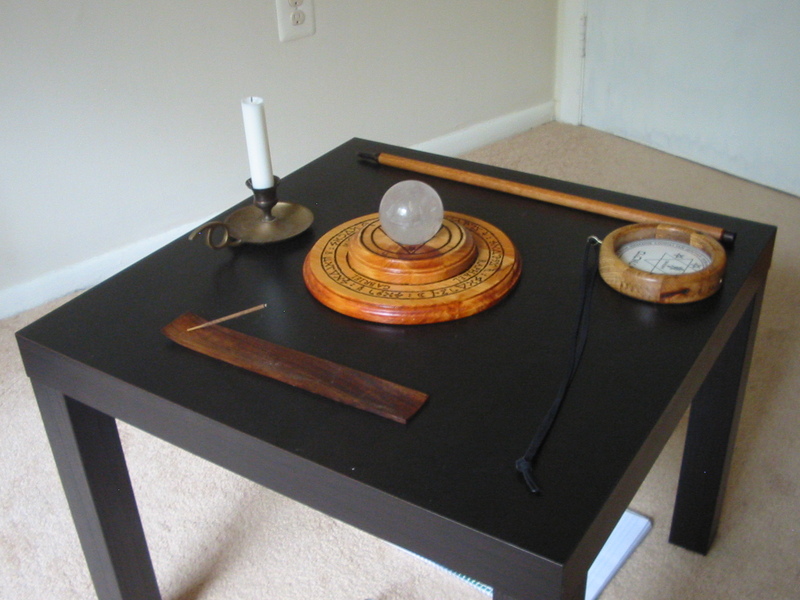 An example conjuration altar is shown below using my own materia and setup. A notebook and pen are helpful for having with you as well to record the ritual or take notes from the spirit, and a candle snuffer is nice if you don’t want to blow out the candle. Trithemius also suggests a physical magic circle with names of God and the seal of the spirit, a Solomonic ring to be worn with the lamen, and a partner to conjure the spirit with as a kind of magical spotter or medium. All these are not strictly necessary, however. The parts that are necessary for the ritual, though, do not need to be distinct pieces of equipment; a chalk circle written with the appropriate names and symbols will suffice for the Table of Practice, as can the extended index finger for the Wand. Since Trithemius (the attributed author of the ritual) was a Christian abbot, and since most magic performed in medieval and Renaissance Europe was propagated and performed by Christian priests, the original ritual is replete with invocations to Jesus Christ. Although not a Christian, I’ve used the same prayers to good success, but I can understand why it might be distasteful in the mouths of others. I’ve altered the prayers based on the Keys of Solomon, Heptameron, and other sources to make the ritual less Christian and more Qabbalistic or Jewish, but either works. I haven’t experimented with Gnostic or pagan godnames, but I don’t see what would prevent one from working with those in this ritual. Perform the ritual in a day and hour appropriate to the spirit you’re conjuring or under otherwise favorable conditions. Purify yourself before the ritual as you find necessary (ablutions, fasting, meditation, contemplation, prayer etc.). Lay out the tools on a clean and cleansed area, positioning the candle to the east, or another direction as necessary. If you have one, put on the ring; pray as you will for guidance, protection, and wisdom. Put on the lamen, charging or intoning the names written on it if desired. Begin the ritual of conjuration. O God, author of all good things, I beseech you, strengthen me, your poor servant, that I may stand fast without fear through this dealing and work. Enlighten me in my dark understanding, o Lord, so that my spiritual eye may be opened to see and know your angelic spirits descending here into this crystal2. Lay your hand on the crystal. O inanimate creature of God, be sanctified, consecrated, and blessed, so that no evil phantasy may appear in you, and that all spirits within you speak intelligibly, truly, and without the least ambiguity. Amen. And as I stand before you, o Lord, grant me the power of scrying those celestial spirits or intelligences that may appear in this crystal, and enable me, by your wisdom and mercy, to use whatever good gifts you may be pleased to bestow on me to the honor of your holy name. You, who live and reign, world without end. Amen. Wear the lamen around your neck. Take up the wand and trace a circle around your area of conjuration. In the name of the thrice-holy Tetragrammaton Elohim Tzabaoth, I consecrate this piece of ground for my defense, so that no evil spirit may have power to break these bounds prescribed here. Amen. Light the incense. Point the wand at the incense. I conjure you, o creature of fire, by him who created all things both in heaven and earth and in the sea and in every other place whatever, that you cast away every phantasm from you, so that no hurt whatsoever shall be done in any thing. Bless, o Lord, this creature of fire, and sanctify it that it may be blessed, and that it may fill up this place with the power and virtue of its odors, so neither the enemy nor any false imagination may enter into here. Amen. Hold the wand out towards the crystal. Now we get to the actual conjuration. In the name of the blessed Tetragrammaton3, I call upon you, you strong and mighty angel Michael4, if it be the divine will of the most holy God that you take the shape that best shows your celestial5 nature, and appear to me visibly here in this crystal, and answer my demands in as far as I shall not transgress the bounds of divine mercy by requesting unlawful knowledge, and that you graciously show me what things are most profitable for me to know and do, to the glory and honor of his divine majesty, who lives and reigns, world without end. Amen. At this point, the spirit should be present. Ask whether there’s someone present, and if so, ask the spirit its name and verify that it is the spirit you conjured in a way you see appropriate. If it answers correctly and truly, go ahead and have a polite chat with it. The spirit may give you inklings of thought or images in your mind or actual eyes, you may hear whispers, or you may just sense words forming out of nowhere; it’s up to the spirit and how they’re used to communicating, or how adept you are at sensing these things. You can lay down the wand if you want at this point and enjoy the conversation, unless you feel a need to be commanding or intimidating. If a spirit is present and is not the one you called, it’s up to you how to handle the situation. You can see if it’s a representative of the one you called (common in the case of angels or powerful spirits with legions behind them), you can try to talk with it anyway and see what it’s up to or what it wanted, or just dismiss it outright using whatever names of power or curses you find handy at the moment. After dismissing the spirit, if you still want to try and conjure the original spirit desired, start the conjuration over from “In the name of the blessed and Tetragrammaton…” above. If no spirit is present or sensible to you, you might want to move onto the dismissal below or try to continue the ritual. Try the conjuration above again until you obtain success, or continue on and ask for different ways for the spirit to be seen or heard by you, or just continue on as normal with your requests. When you’re done, take up the wand again and give the spirit leave to depart. O great and mighty spirit Michael, I thank you for your presence. You have come as I have called, and aided me as I have asked. As you came in peace and in the name of the ever-blessed and righteous Tetragrammaton, so in this same name you may depart, and return to me when I call you in his name to whom every knee bows down. Farewell, Michael; let peace be between us, here and everywhere, now and always, by and for the sake of the Almighty. Amen. To God the father, the eternal spirit, the fountain of light, the creator of all creation, and the sustainer of all life be all honor and glory, world without end. Amen. Snuff the candle and take off the lamen and ring with any concluding prayers or rituals you find necessary. The ritual is finished. This and the consecration of the incense seem to be taken verbatim from the Heptameron. Or whatever scrying medium you prefer to use (mirror, bowl of water, etc.). Or whatever the name is of the spirit you’re summoning. Or whatever names of God or deities you feel appropriate for the ritual, e.g. Elohim Tzabaoth to conjure a spirit from the sephirah of Hod, or Adonai ha Aretz or Adonai Melech for a sublunar spirit; Iaō or the expanded Aeēiouō work as well. Or whatever nature the spirit has (elemental, natural, chthonic, etc. ).